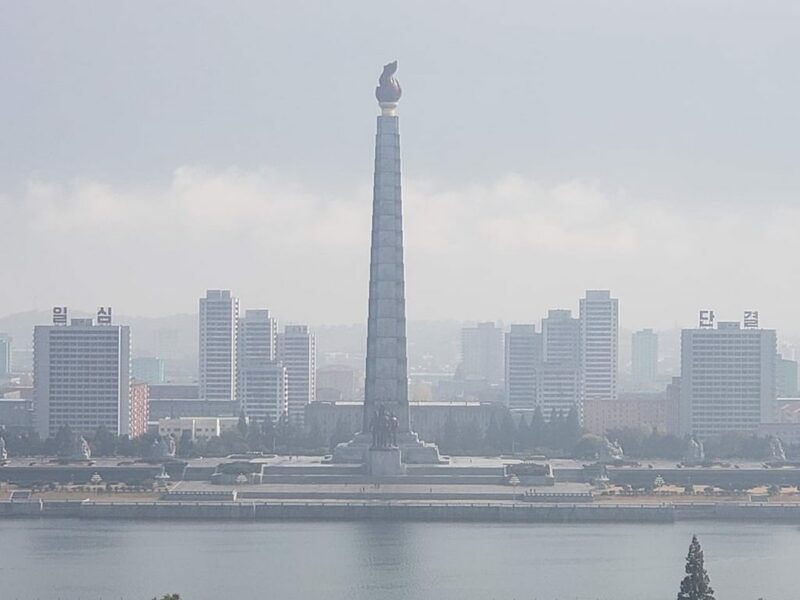 Note: This is the third and final installment of a three-part series on my trip to North Korea. 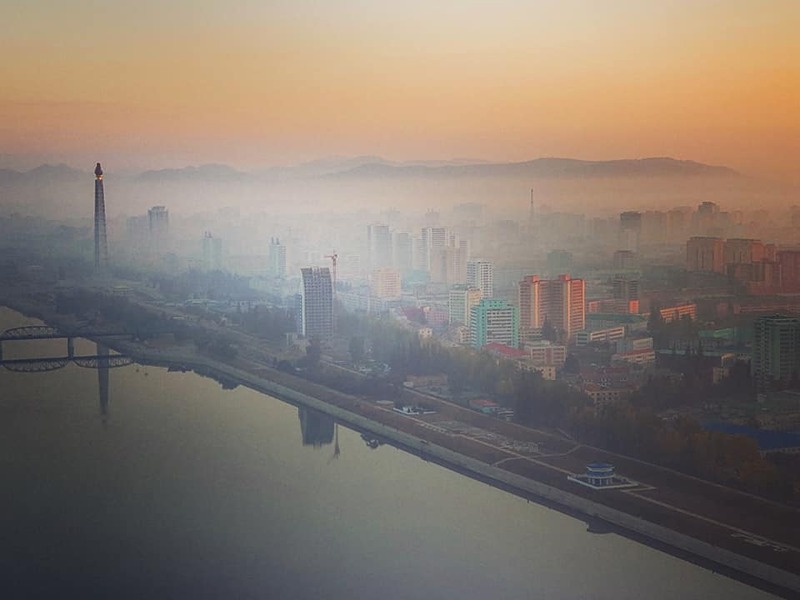 As expected, this last part of the series is about my stay in the North Korean capital Pyongyang. To see what is like to cross into the DPRK by foot and speak face-to-face with North Korean kids, read part 1. And to explore North Korea’s surprisingly beautiful nature, read part 2 (plenty of photos included). Pyongyang was the grand finale of my North Korea trip. But my expectations were tempered. I didn’t know the trip would end with a bang… or a mass bang. I shall explain. But first, I’ll remind you that to some extent the DPRK had already shown me its true colors. In particular, Mount Chilbo was very colorful, though that’s not exactly what I’m getting at. Rather, by true colors, I mean I got to experience a hotel without running water and with almost no electricity, but later took a domestic flight to Pyongyang on a plane with business class (Whatever happened to the classless society?). These intricacies — seeing both blatant poverty and an element of a market economy — give me a better impression than most tourists get of what North Korea is really like. Granted, I didn’t visit any labor camps, or anything of that nature, but the tour I was on was called the “Real Deal” DPRK for a reason, and to a decent extent, it lived up to the billing. In Pyongyang I would continue to see contrasting facets of North Korean society. I’d have to perform ritualistic worship of dead dictators. Yet I would find myself drinking western beer with plenty of options to choose from. I’d also drift out of the capital briefly to get a glance at the famed North-South Korean border that is frequently in the news. Without further ado, let’s get started in Pyongyang. Having flown in from Orang, we were driven from the airport into town. There were a couple hours of daylight remaining, and we wanted to make use of them. 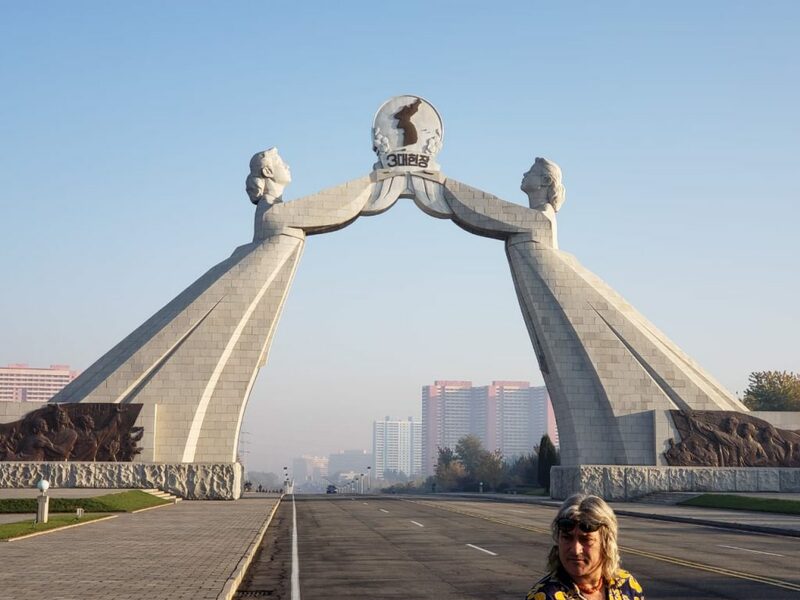 On the way into town, we stopped at the North Korean version of the Arc de Triomphe. 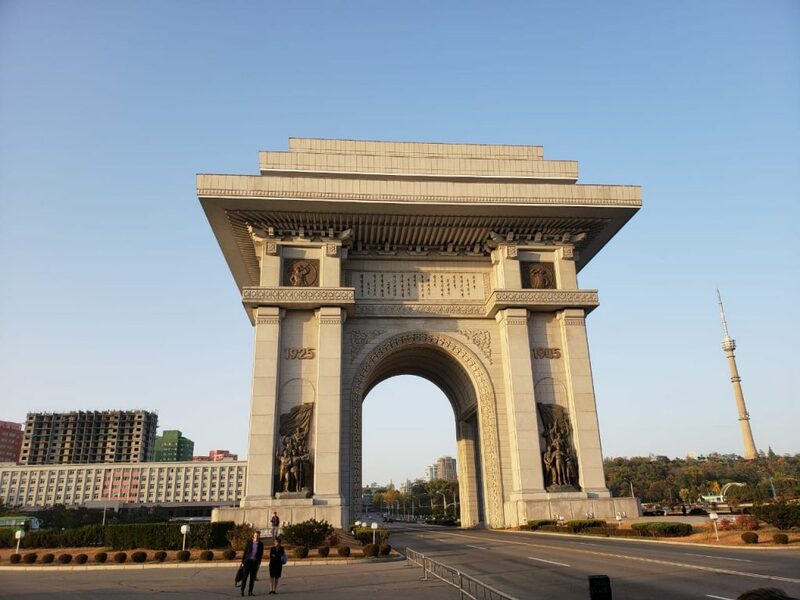 The DPRK’s Arch of Triumph, located in the north of Pyongyang, is of course taller than the original Arc de Triopmhe in Paris. North Korea’s triumphal arch is 60 meters high, making it the second tallest triumphal arch in the world. As is the case in Paris, you can climb to the top of the arch. In Pyongyang, though, you don’t need to climb stairs. An elevator took us to the top. At the top there were great views of all of Pyongyang. I took a bunch of photos as the sun was going down. 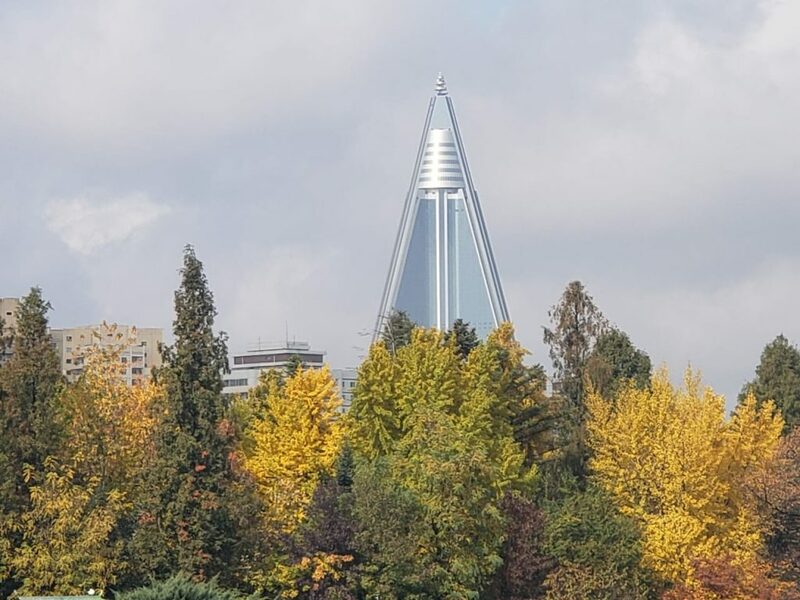 A focal point of these shots was Pyongyang’s large TV tower, as well as the gigantic Ryugyong Hotel that has been under construction since 1987 and is still unfinished. The 105-floor structure is the tallest unoccupied building in the world. This arch wasn’t nearly as beautiful as the arch on Mount Chilbo, but the views were comparable — granted they were of communist-style cityscape, not coastal mountain landscape. After getting down from the arch, we headed into the city center. Kim Il-sung Square is the main square in Pyongyang. Obviously it’s named after Kim Il-sung, who you know from part 1 was the founding leader of the DPRK. The square was built amid the devastation of the Korean War when Pyongyang was being reconstructed. It is one of the largest squares in the world and can hold more than 100,000 people. Kim Il-Sung Square is quite similar to Tiananmen Square in Beijing. It’s used for military parades, government-run rallies and memorial events etc. Kim Il-sung Square is, or rather was, the location of the annual anti-United States rally in North Korea. A few months before I arrived, the current leader Kim Jong-un had his summit with Donald Trump, which resulted in the cancelation of the 2018 anti-U.S. rally at the square. While at the main square, we visited the National Library of North Korea in which I found some German books that probably came from the DDR. One book was about German food. I found it interesting. Atop the library there was another viewpoint with more nice views of the city. Itching for more reading, we went to a book store near the main square. I bought some propaganda for myself and my family. As Christmas presents, I got some books for my brothers. They contained the aphorisms of Kim Il-sung and Kim Jong-il. From there we headed to the hotel to check in and have dinner. Our hotel was a tall building with a revolving restaurant at the top. I stayed on the 70th floor in a room with nice views, especially in the morning. 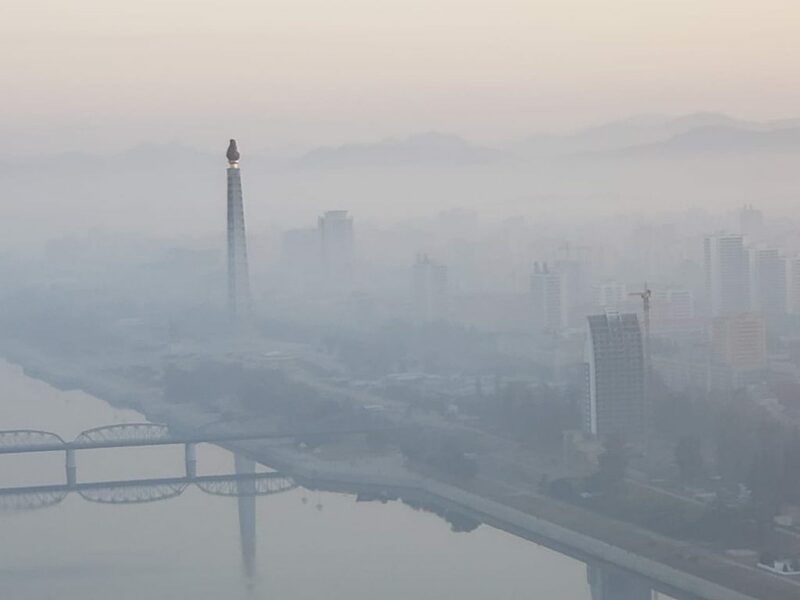 I enjoyed snapping photos from my hotel room of the morning fog weaving in and out of the Pyongyang skyline. The hotel provided a much higher level of comfort than our initial accommodation in the north. For instance, this hotel had hot running water and electricity. However, there was still no internet. We had three full days in Pyongyang (sort of), two of which each featured one main touristic activity. 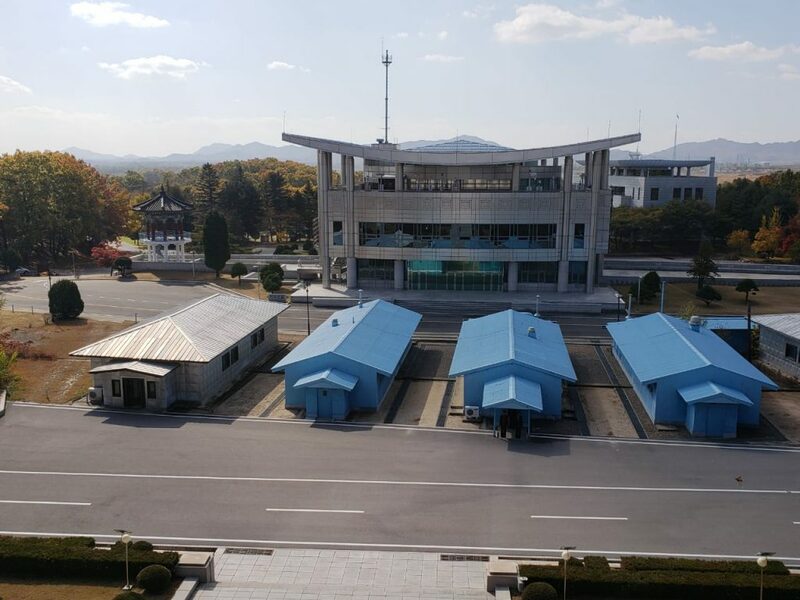 The main event on one day was a trip to the famous demilitarized zone (DMZ), which in reality, has been the most militarized border in the world for decades. On the other day the main event was a visit to the mausoleum where the bodies of the two deceased great leaders lie embalmed. Down close to the border we hit a traffic jam. The area draws lots of tourists, mostly from China. North Korean officials only let in a few buses at a time, and we had to wait an hour. Nowadays the building is called the North Korea Peace Museum. The museum contains the chairs in which the Americans and North and South Koreans sat during the signing of the agreement. It also houses lots of propaganda about how the U.S. and South Korea started the war and how North Korea won it. Following the peace museum, we were driven to the real border, where we visited the Phanmun Pavilion. This is a building located just meters away from the demarcation line. It’s what Kim Jong-Un stepped out of to walk to the demarcation line when he met South Korean President Moon Jae-in for the inter-Korean summit that took place about a half year prior to my visit. It so happens the Phanmun Pavilion looks identical to a building that lies directly across the demarcation line on the South Korean side. The building on the South Korean side is called the House of Freedom. We could see the House of Freedom from the Phanmun Pavilion. At times tourists on the North Korean side and can see tourists on the South Korean side. It wasn’t the case for us. 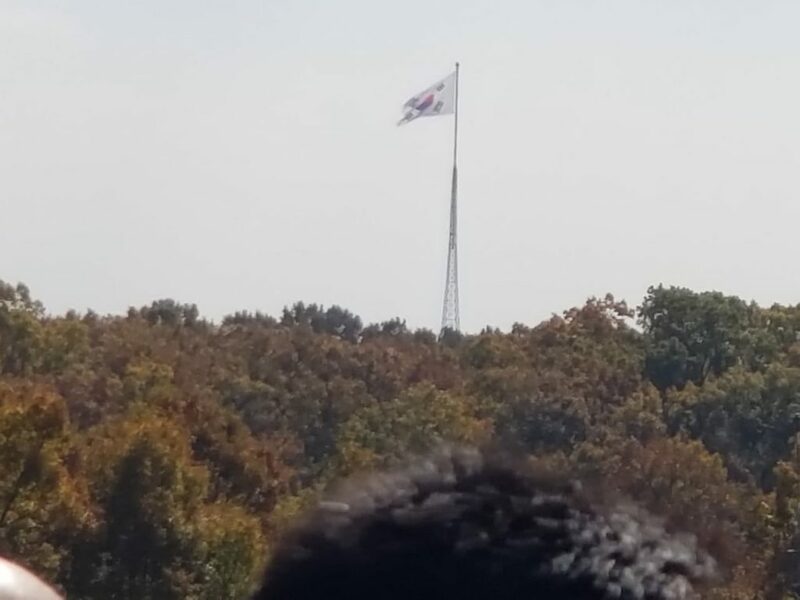 Nonetheless, we saw the South Korean flag — the flag of freedom. While returning to Pyongyang from the DMZ we stopped at a restaurant that served more of a good-old Far East delicacy… dog meat. But after the meal in Tumen, most of us had enough of eating dog and opted for something more normal. 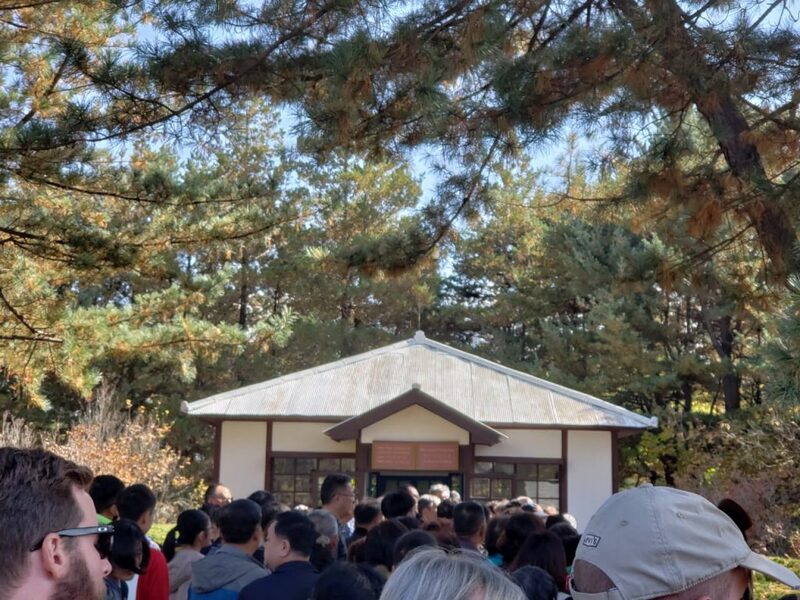 This is the part of a DPRK trip where things get less touristy and more ritualistic — in the sense that visiting the mausoleum where Kim Il-sung and Kim Jong-il lie embalmed feels a lot like performing a religious ritual. 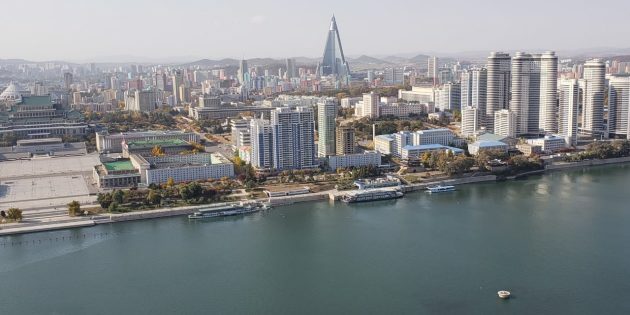 Yes, North Korea is an atheist state. But the country is not without worship. The mausoleum is formally called the Kumsusan Palace of the Sun. 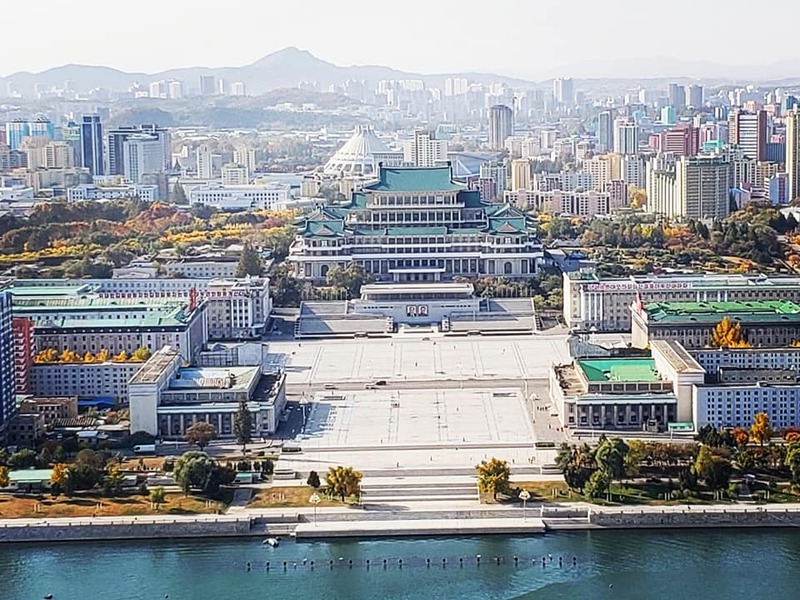 It is a large palace that initially served as Kim Il-sung’s official residence, but was converted into a mausoleum following his death in 1994. The embalmed bodies of Kim Il-sung and Kim Jong-il lie inside glass sarcophagi, each in their own room in the palace. From the inside the palace seems even larger than it does from the outside. Following a long wait, we entered the palace and proceeded to head underground on moving walkways. The moving walkways went on and on and on for about a half hour. As you head deeper into the mausoleum on the moving walkway, there are pictures on the wall showcasing the lives of the two deceased great leaders. As the moving walkway ever so slowly brings you to the area where the embalmed bodies rest, basically all you can do is look at photos of Kim Il-sung and Kim Jong-il. You enter one of the great leaders’ rooms, and you must bow three times — once from west of the sarcophagus, once from the north and once from the east. You do not bow from the south. You get a total of 1 minute to spend inside the room and marvel at the body of the eternal leader. The process repeats with the other leader. 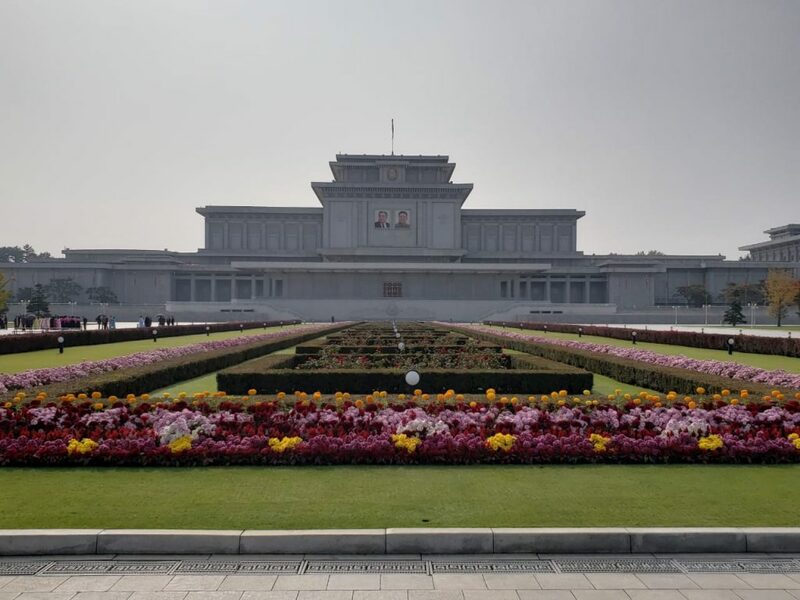 After marveling at and paying your respects to Kim Il-sung and Kim Jong-il, you get the opportunity to go into adjacent rooms where many of their possessions are preserved. There you find the great leaders’ uniforms, certificates, medallions and basically every award they received from other states. Additionally, you get to see the cars and even a helicopter in which the great leaders traveled during their lives. Most notably, one mausoleum exhibit contains a train, which was the preferred method of transportation for both Kim Il-sung and Kim Jong-il. It so happens Kim Jong-il died on a train ride. The train in the mausoleum is the very train on which Kim Jong-il died. The train exhibit is quite a sight. Everything is left as it was when the great leader died. The train is very old-fashioned, yet sitting on Kim Jong-Il’s desk is a big Apple laptop. Specifically, it’s a MacBook Pro, the newest model from the time of his death. No cameras and photography are allowed inside the Kumsusan Palace of the Sun. Outside the mausoleum, though, you are allowed to snap away. After returning to daylight we took photos of the large palace. There is a lot to see in Pyongyang: monuments, museums and plenty of other tourist attractions. Let’s start with the monuments. Since you haven’t had enough of Kim Il-sung and Kim Jong-il already, we’ll head straight to Mansu Hill, where it is impossible to ignore the two 20-meter tall statues of the deceased great leaders. Mansu Hill has a collection of monuments and is one of the most sacred sites in North Korea. 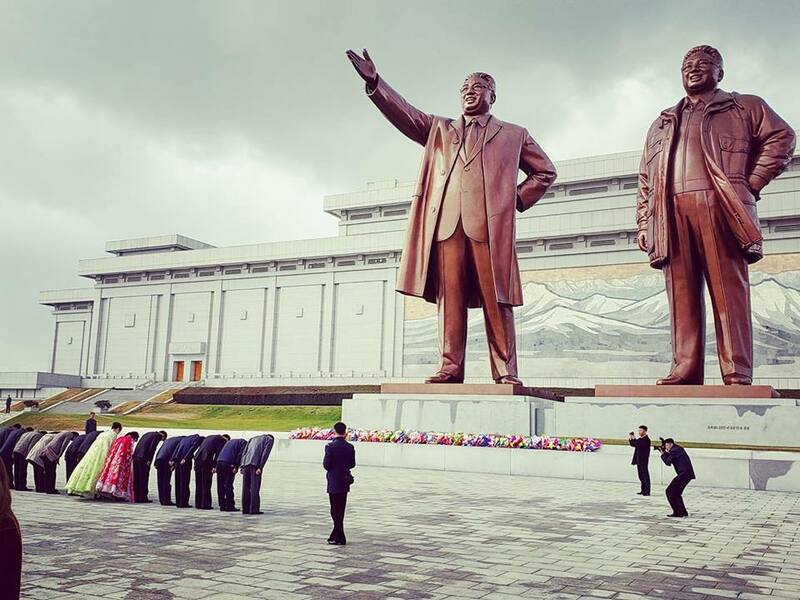 North Korean couples visit the statues of the great leaders on their wedding day and celebrate their marriage together with their eternal leaders. Both locals and foreigners are expected to leave flowers to show their respect to Kim Il-sung and Kim Jong-il. As is the case inside the mausoleum, you must bow before the leaders, though you only need to bow in front of the statues, as opposed to on three sides of them. Unlike inside the mausoleum, you are allowed to take photos of the great leaders’ statues. But the photos must include the entirety of the statues. No exceptions. Notice the mosaic of Mount Paektu in the background? We’re going to Mount Paektu, right?? You may be wondering why Kim Jong-un doesn’t get a statue. In fact, there is no stature of Kim Jong-un anywhere in North Korea. That’s because he is still alive. The supreme leader of the DPRK gets a statue and memorialized all over the country once he dies. 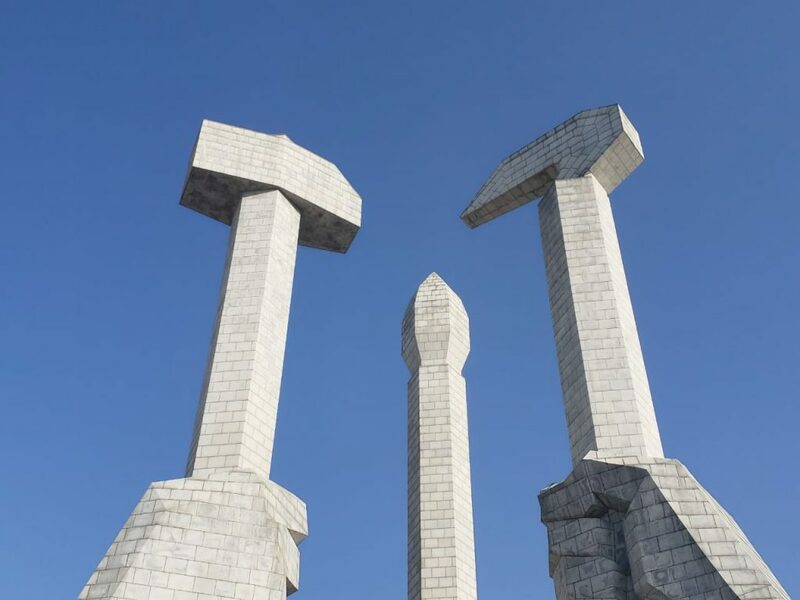 Other monuments we visited included the Monument To Party Founding and the Juche Tower, both of which feature the famed communist hammer and sickle symbol. 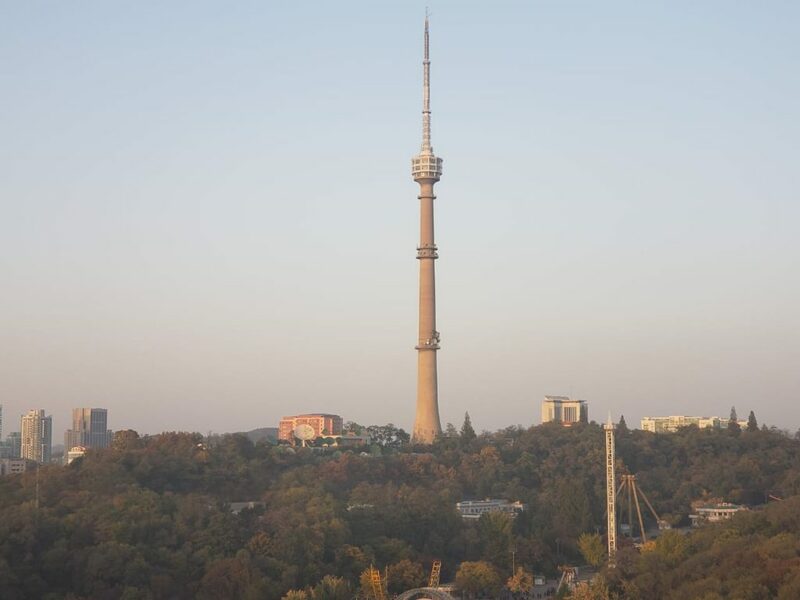 The Juche Tower is another can’t miss — in terms of visibility — landmark in Pyongyang. Lying across the Taedong River from Kim Il-sung Square, the tower is named after the DPRK’s state ideology. Juche basically means self-reliance, and it is essentially North Korea’s unique brand of socialism. On a much less communistic note, as mentioned in the Mount Chilbo post, there are Buddhist temples in North Korea. We visited a few temples in the Pyongyang area. 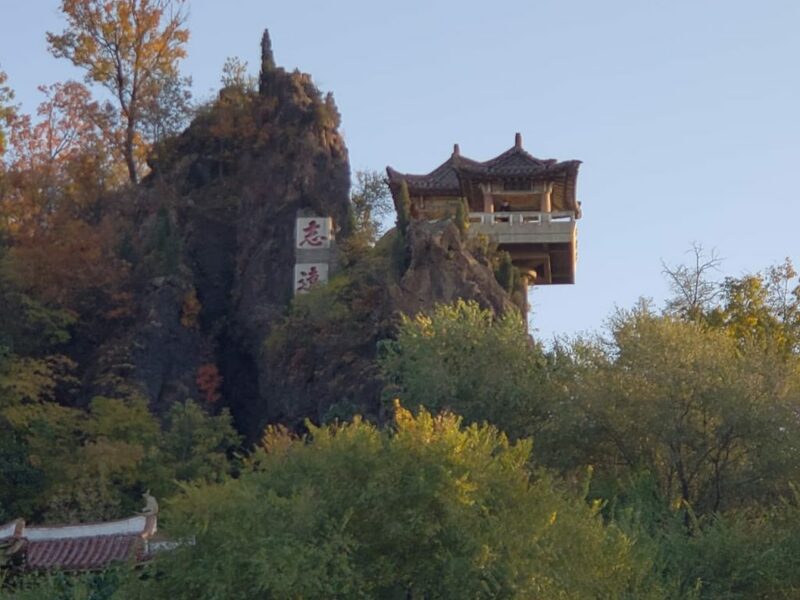 This one old Buddhist temple that is standing, or hanging, on top of a rock is quite picturesque, as are the town and landscape surrounding it. Another interesting sight, which unfortunately we only passed by, was the Pyongyang zoo. 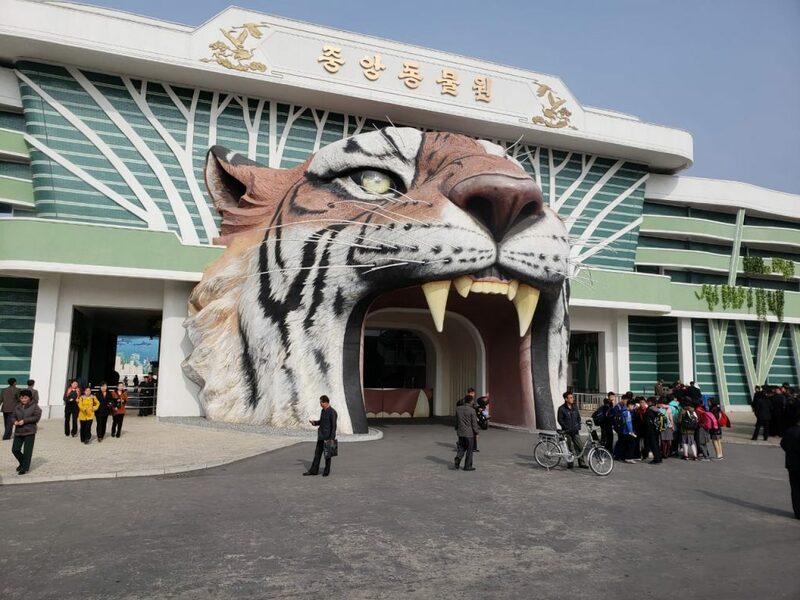 The Korea Central Zoo, which is the national zoo of the DPRK, has a giant tiger head for an entrance. Apparently, it’s a large zoo with more than 5,000 wild animals and 650 different species. How’s that for a zoo entrance? 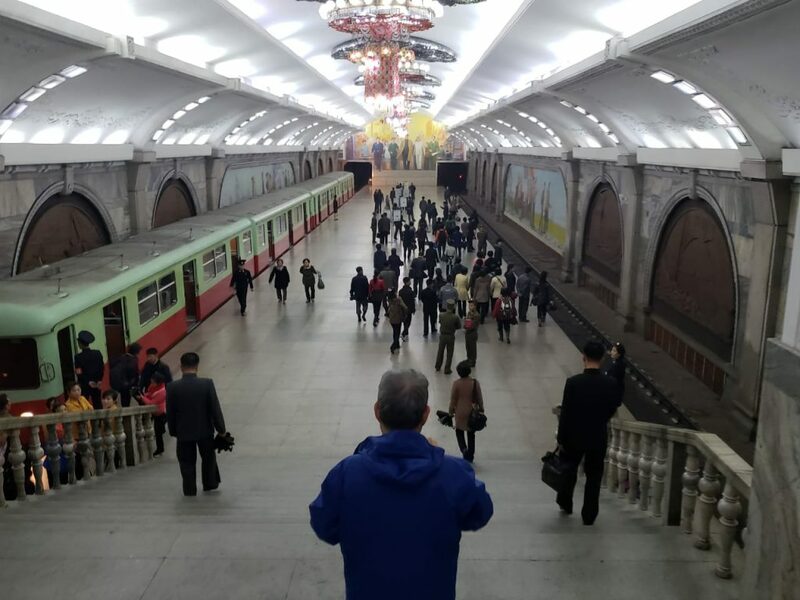 Something we did do was go for a ride on the Pyongyang metro. The stations have a similar look to Moscow, or at least Soviet, metro stations — very socialist looking underground transport. 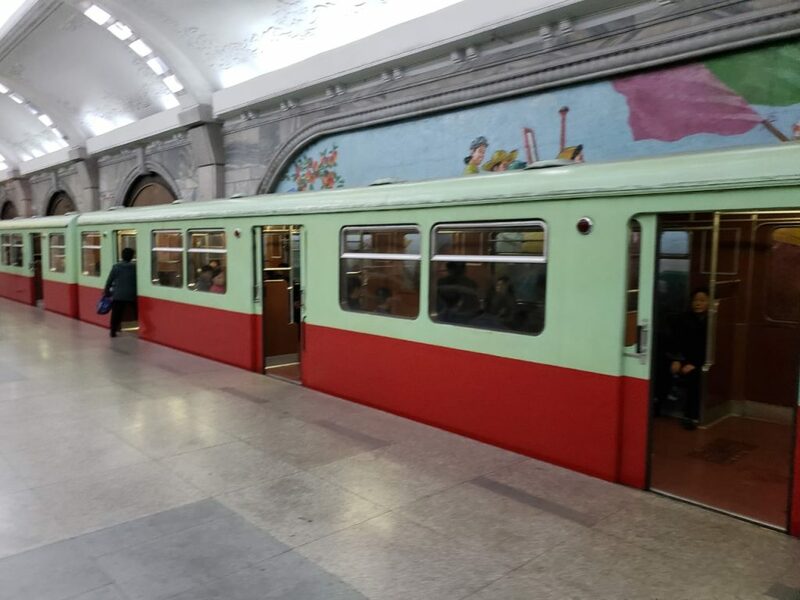 It so happens the Pyongyang metro uses former East German trains. Our museum visits were highlighted by the Victorious War Museum. This is where the DPRK stores some its greatest treasure — captured American military hardware. 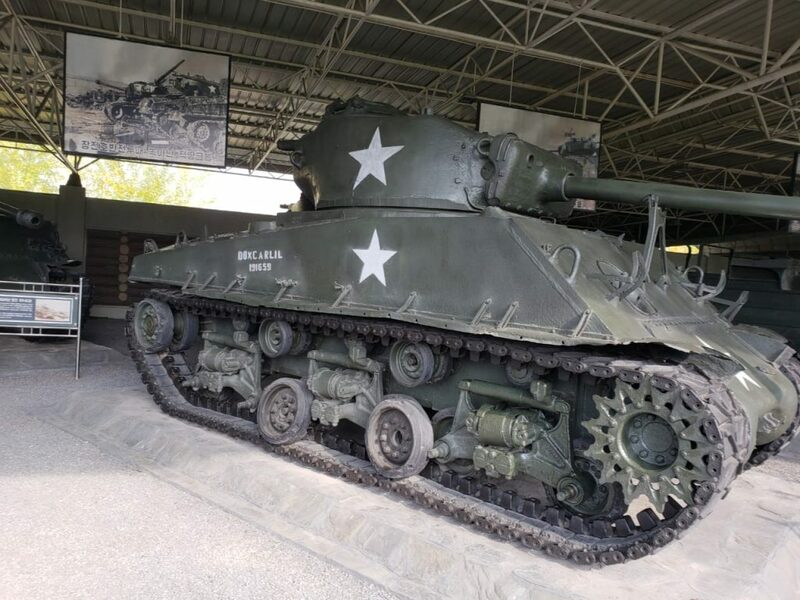 Inside North Korea’s war museum there are captured American weapons and helmets, as well as a helicopter, showing that the DPRK defeated the evil American imperialists. There is also some North Korean hardware, like a tank, which I think they got from the Soviet Union. The main exhibit is actually situated outside the museum. It is the USS Pueblo, an American navy vessel that was captured by North Korea in 1968. The Pueblo incident evolved into a hostage crisis in which North Korea held the American crew members as prisoners for nearly a year. North Korea says the whole incident started because the USS Pueblo sailed into DPRK waters. 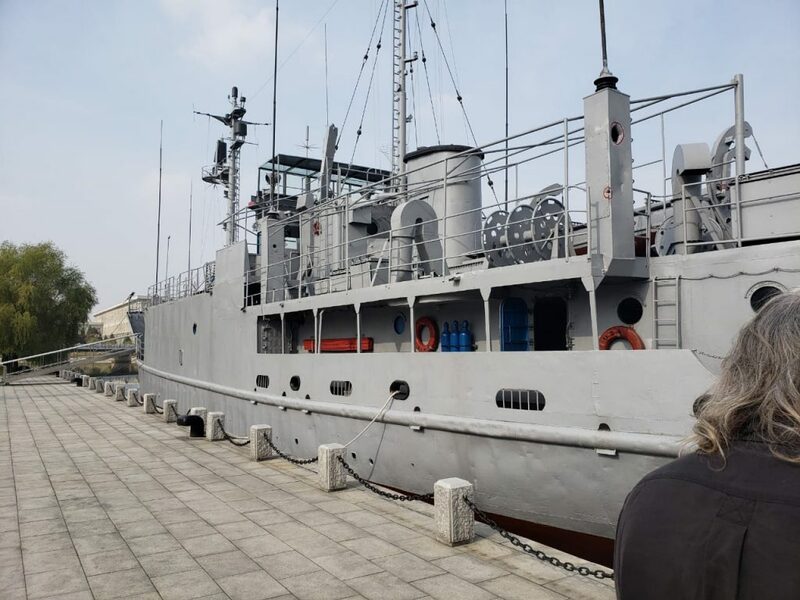 Nowadays the ship is permanently moored on the Taedong River next to the war museum. Visitors can board it. There is a man watching over the ship who says he was the North Korean captain who captured the USS Pueblo. We had a short talk with him. We were also showed a bunch of original documents which are said to prove the Americans indeed were in North Korean waters. 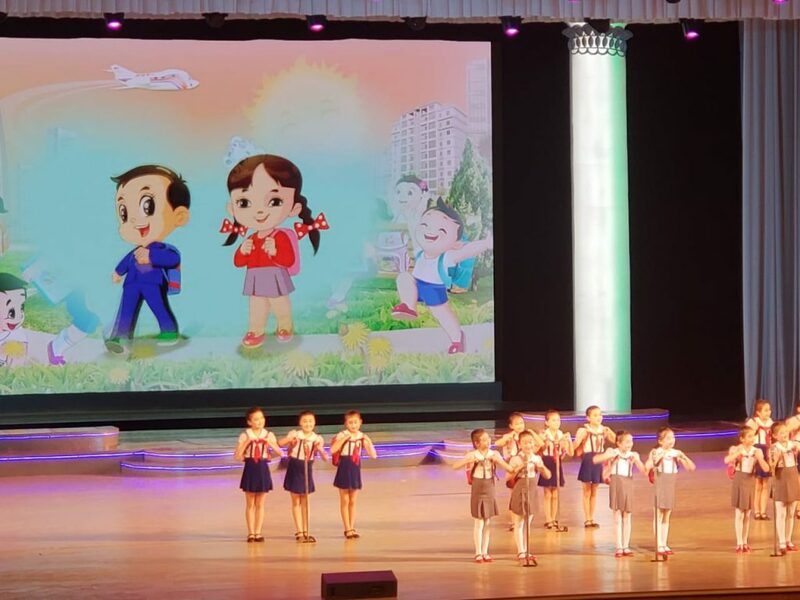 Having read about our excursion in North Korea’s rural northeast, you are aware that North Korean schoolchildren are remarkably talented at playing piano and other performing arts. 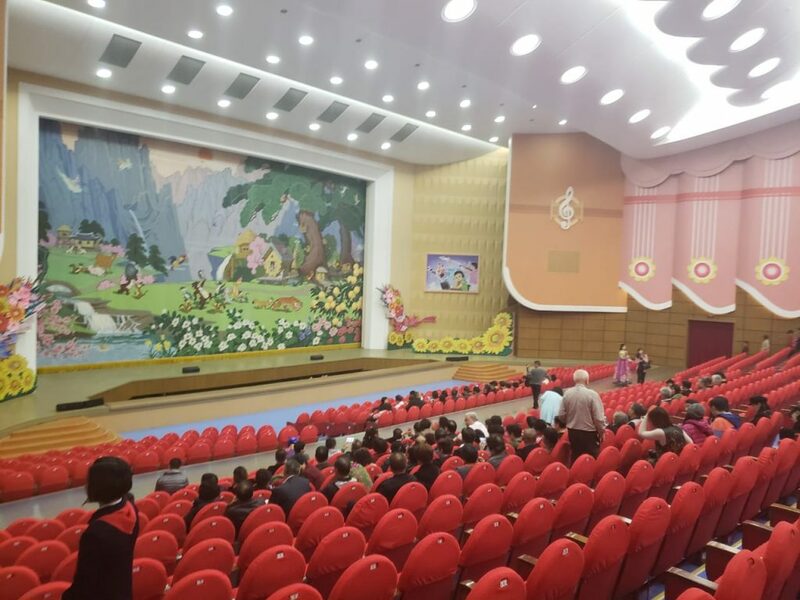 In Pyongyang, schoolchildren excel in certain performing arts and sports due in part to the Mangyongdae Children’s Palace. This is a palace devoted exclusively to extracurricular activities. Students go to the children’s palace after school and practice playing instruments, dancing and sports, as well as developing foreign language and computer skills. Inside the palace we were treated to another big show of kids dancing, playing music and doing other fun stuff. It is abundantly clear that North Korean kids grow up spending hours a day learning and perfecting various crafts. While you may not be surprised we attended another children’s recital, you probably weren’t expecting that the North Korea trip would include a stop at a brewery — unless you read our itinerary or the intro to this post. The surprise wasn’t merely that North Korea has a beer scene but the variety of beers that are offered. The brewery had western beers, like Erdinger, Beck’s, Warsteiner (notice the German theme?) and more. 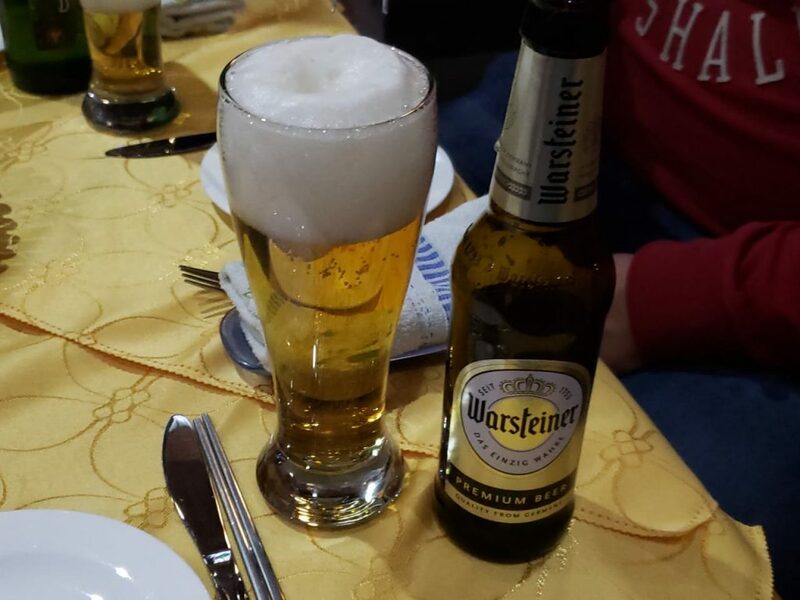 I enjoyed a Warsteiner while also chowing down on some western food. But the evening in a North Korean brewery wasn’t without a local delight. 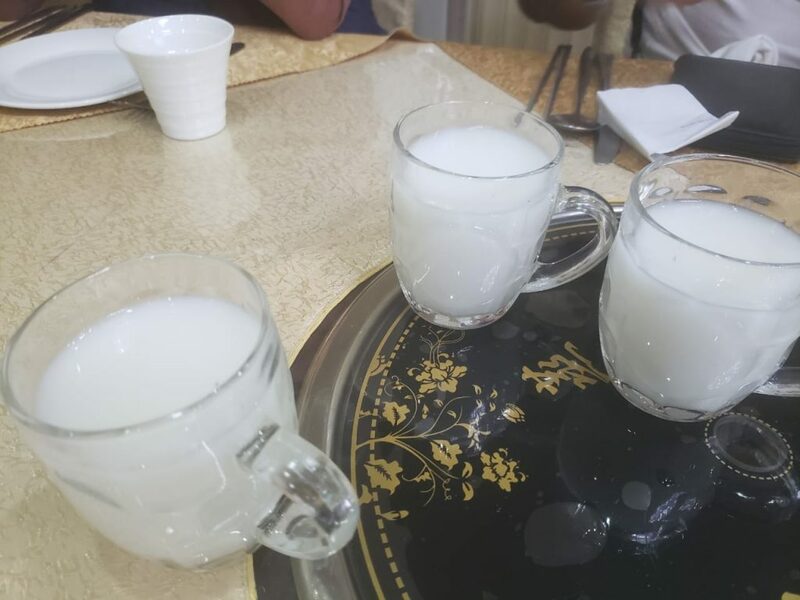 We also enjoyed some milk-looking drink made from rice that is like a sweet cider. And to top it all off, there was actually wifi inside the place. Crazy, huh? But the biggest surprise was definitely what we did on the final night of the trip. 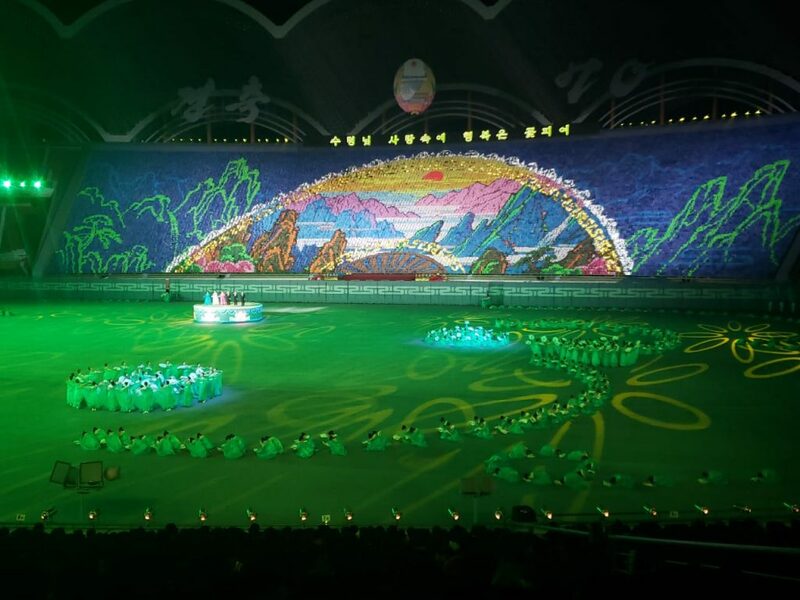 Everyone who comes to North Korea has surely heard of the mass games. Unfortunately the mass games were not on our itinerary. We weren’t expecting to take part in the festivities. But it just so happened that the last or second to last mass games performance of the year was on the final night of our trip. What are the mass games? They are basically a massive gymnastics performance involving many thousands of gymnasts and performers. Mass games have occurred in some other countries over the years, but they are most associated with North Korea. 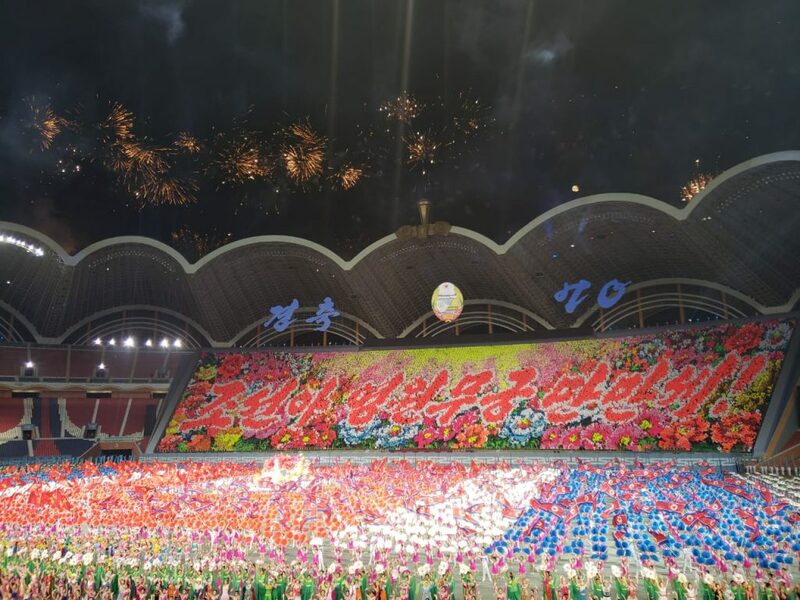 In the contemporary DPRK the mass games take place in the approximately 150,000-seat Rungrado May Day Stadium in Pyongyang, the largest stadium in the entire world. 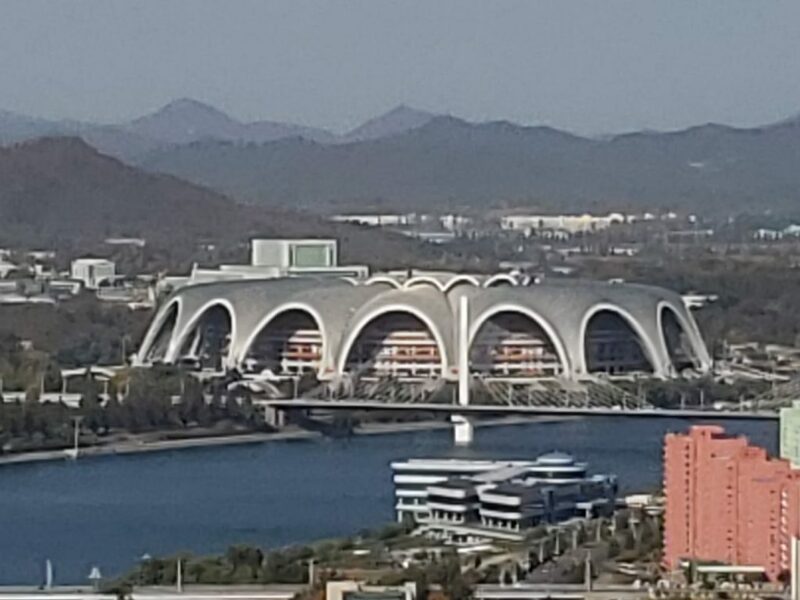 The stadium is located on an island in the Taedong River, and it also stands out in the Pyongyang cityscape because of its 16 arches. We had the worst seats in this gigantic stadium. Yet, the tickets still cost $100 each. You can get much better seating and even VIP tickets if you pay a lot more, but it’s not really worth it. Despite our bad seats, we could see the performance perfectly fine. We could also tell that North Korea makes good money off this event, which draws a lot of tourists, particularly Chinese visitors. 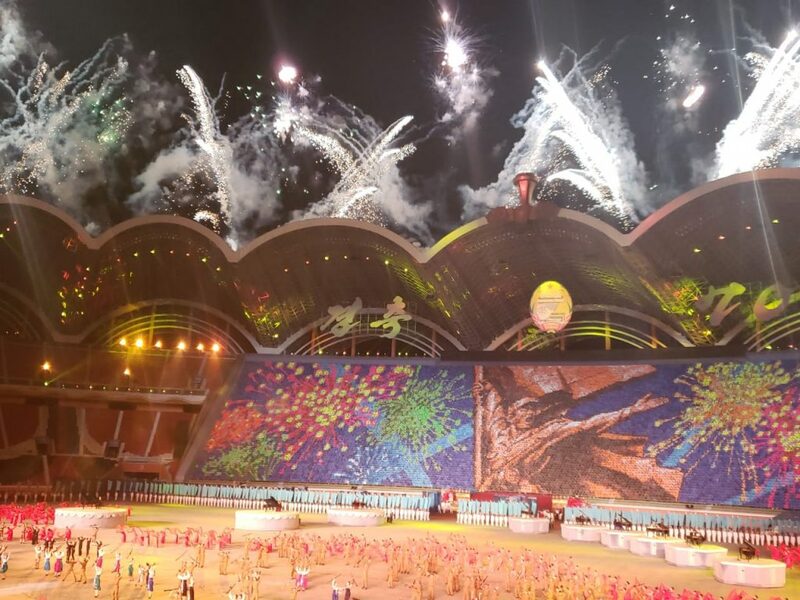 The show consists of a 90-minute display of gymnastics, acrobatics, dance and other types of performances by 50,000, or even up to 100,000 people on the floor of the stadium. Most, though not all, of the performers are schoolchildren. As performers are jumping on trampolines and doing all kinds of stunts on the floor of the stadium, another 70,000 or so schoolchildren are holding papers or placards on the side of the stadium across from where the audience is seated. Put together, the papers the kids are holding basically function as a screen showing large images and messages. Some people have thought these images were appearing on an actual screen, but having been there to see it, I can attest human beings are there holding and changing the papers or placards. Another interesting feature of the mass games was a synchronized flight of some kind of drones with lights. The performance also included lots of music and singing. It’s a bit difficult to convey in writing what it’s like to witness the mass games. It’s really something that in order to understand you need to see with your own eyes. As you might imagine, there is definitely a political element to the mass games. The performance was previously called Arirang, the name of a Korean folk story about a couple torn apart by an evil landlord, which represents the division of Korea. The games went on hiatus and then returned in 2018, the year I visited the DPRK, under the new name of Glorious Country. The performance has a socialist-realist style. Kim Jong-il, who was influential in the development of the mass games in North Korea, said the performance fosters physical fitness, discipline and collectivism in schoolchildren. Regardless of the politics, the show is impressive and it turned out to be the highlight of my North Korea adventure. After it ended, we returned to the hotel for a final drink and a final night of sleep. The following day we boarded the 1.5 hour flight from Pyongyang to Beijing. It’s worth mentioning that the Pyongyang airport has a business class lounge and Air Koryo, the North Korean flag carrier, has business class aboard its flights. Once again, so much for that classless society. I was quite happy to leave North Korea. I didn’t fear something would happen to me, like being held inside the country. But as is the case with other communist countries, like Cuba, I get a very depressing feeling after a while. The issue may also have been my Internet addiction. I like a digital detox once in a while. But 10 days without internet is certainly long enough for me — maybe too long. Also, I should clarify that my impression of the DPRK is that it really is not a communist state. It’s socialist for the most part, though elements of the free market flourish in North Korea. The country is highly nationalist and anti-imperialist, but I also gathered from talks with our guides and other North Koreans that the country is opening up. North Korea is getting friendly with South Korea, and it doesn’t want problems on the world stage. That’s good news for me, should I want to return some day and walk through the tiger’s head to get a look at the wild animals and sea creatures. 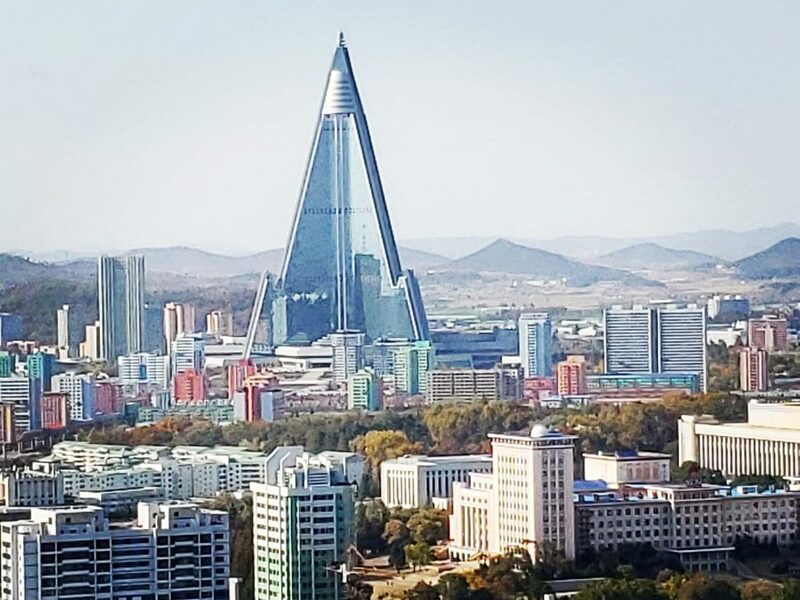 And maybe by the time I’m back, the Ryugyong Hotel will finally be finished and I will stay on the hundredth floor, looking down on the Glorious Country from above.